A jury heard the corruption case of former New York Assembly Speaker Sheldon Silver boiled down on Monday to two conflicting portrayals of the once-powerful Democrat: one as a greedy lawmaker who enriched himself with bribery and another as a seasoned politician who played by the rules regarding outside income. In his two decades as speaker, Silver devised schemes to collect millions of dollars in kickbacks in exchange for using his office to do favors for a cancer researcher and real estate developers, Assistant U.S. Attorney Andrew Goldstein said in closing arguments in Silver's trial in federal court in Manhattan. "Why did Sheldon Silver do it? He did it for the money," Goldstein repeatedly told the jury. The evidence, he added, "shows that Sheldon Silver was a master of every form of deception — lying, keeping secrets, even splitting hairs." He also took aim at the defense's accusation that overzealous prosecutors were trying to criminalize behavior that's politics as usual in the Assembly. "Let's dispense with the nonsense ... and let's talk about the evidence, which Sheldon Silver tried desperately to keep secret for years," he said. Defense attorney Steven Molo countered by accusing the government of embracing a flawed theory of a circumstantial case. In their eyes, "If a fact gets in a way of that theory, you ignore it, and if you can't ignore it, you twist it," he said. He added: "A lesser person would have folded, but Sheldon Silver is a fighter. He knows he did not commit a crime. There was no quid quo pro. He did not sell his office." Silver, 71, has pleaded not guilty to bribery and extortion charges in an investigation that increased scrutiny of politicians in Albany. The jury was expected to begin deliberating on Tuesday. On Monday, Goldstein detailed one alleged quid-pro-quo deal in which he said Dr. Robert Taub steered his patients with cancer caused by asbestos to Silver's law firm, allowing the lawmaker and lawyer to secure more than $3 million in referral fees from personal injury claims. In exchange, Silver steered $500,000 in taxpayer funds to Taub's research projects and helped his son and daughter get a job and an internship, the prosecutor said. "The defendant got one hell of a quid from the asbestos scheme," Goldstein said. "The defendant gave Dr. Taub all kinds of quo." Aside from the asbestos scheme, prosecutors have accused Silver of persuading some of New York's biggest developers to hire a second, smaller law firm that secretly funneled $700,000 in fees to the ex-speaker. During the same period, Silver worked behind the scenes to deliver tax-abatement and rent-control legislation that favored developers — part of a pattern of corruption that netted the lawmaker $5 million in illicit income during his reign as speaker, prosecutors say. 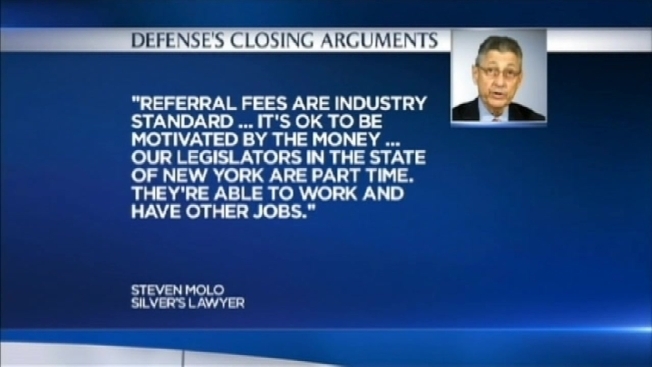 Molo sought to highlight testimony by Taub claiming that he didn't view his involvement with Silver as extortion or a bribery scheme, and that of developers who said they didn't even know Silver was collecting legal fees. "It takes two to tango," the defense attorney said. "It's an awfully odd bribery scheme to have two parties not on the same wavelength." Silver quit his speaker post after his arrest, but retained his Assembly seat. His trial is taking place simultaneously with that of state Sen. Dean Skelos and his son at a nearby courthouse on charges that the Republican badgered companies reliant upon his legislative support to funnel more than $300,000 to the son. Associated Press Writer Larry Neumeister contributed to this report.